The official flag of Texas was adopted in session by the Third Congress of the Republic of Texas in Houston, January 25, 1839, on motion of William H. Wharton, Oliver Jones and others. It specified that the flag should consist of "a blue perpendicular stripe of the width of one-third of the whole length of the flag and a white star of five points in the center thereof and two horizontal stripes of equal length and breadth, the upper stripe of white, the lower of red, of the length of two thirds of the length of the whole flag." There was no other specification of the Flag of Texas until a statute was passed by the Forty-Third Legislature (Acts of 1933, p. 186, ch. 87) clarifying but not changing the original description given here. The statute did add specifications, however, one being that the star, from topmost to lowest points, shall be approximately one-third the depth of the blue field. Colors in the flags of both the United States and Texas mean red for courage, white for purity and liberty, and blue for loyalty. The committee, headed by Oliver Jones, which wrote the recommendations in 1839 for the present Lone Star Flag, specified that the meanings should be white for peace, red for war, and blue for friendship. However, this part of the recommendation was not adopted by the Texas Congress, and the meanings of the colors in the national and state flags are commonly accepted as being identical. The Texas flag is the only flag of an American State having previously served as a flag of a recognized independent country. The Lone Star Flag described above was not the first official flag of the Republic of Texas. A flag consisting of a blue field with a large central gold star was adopted by the first Texas Congress, December 10, 1836. The design was suggested by President David G. Burnet and it is sometimes called the "Burnet flag." It was the flag of the Republic from 1836-1839. At the same time, the Congress adopted a Texas Navy flag which had been officially recognized as early as April 9, 1836, by President Burnet. This flag, described in Brown's History, was composed of "union, blue star central, with thirteen prolonged stripes, alternate red and white." It was like the United States flag except there was a single star on the blue field. There is also record of a convention-adopted flag in May, 1836, by a committee of five including Lorenzo de Zavala. This flag, consisting of a blue field and a white star with the letters T-E-X-A-S between points of the star, seems not to have been given more than momentary official recognition. Many flags have flown over Texas with varying degrees of sovereign authority and of these, six are most widely mentioned in the history of Texas. They are the sovereign flags of Spain, France, Mexico, the Republic of Texas, the Southern Confederacy, and the United States. The above flags are in one classification, a second classification included a large number of flags flown by various military units during the Texas Revolution prior to adoption of the Lone Star Flag officially in 1839, and a third classification of flags is recognized during the turbulent period of 1811-1821 when several attempts were made to free Texas from Spanish rule, following the failure of the Hidalgo revolt in Mexico. The Spanish flag - the red cross of St. Andrew on a white field - was flown from 1519, when Pineda explored the Texas coast, until 1668 and again from 1707 until 1785. Sometime between 1668 and 1707--the colors were reversed - the white cross on the red field. Either color arrangement might be used appropriately in a group of the six flags, although the white field with the red cross was in use longer. The cross of St. Andrew was also called the cross of Bourgogne since St. Andrew was patron saint of the feudal lords of Bourgogne. The French flag was a white cross with scattered golden fleurs-de-lis, planted on Texas soil by LaSalle, according to most authorities. Although used by LaSalle as the personal flag of the King, it was not properly the national emblem. The Mexican flag is a tri-color of green (next to staff), white (center), and red. On the white field is the coat-of-arms of Mexico: the eagle above the cactus with a serpent in its beak. The flag of the 1821 era is sometimes represented with the coat-of-arms enclosed by a wreath of laurel and oak. Three different flags were adopted by the southern Confederacy. The first one, the Stars and Bars, is best known, and consists of a blue field in the upper corner, next to the staff, with white stars in a circular position and three stripes (bars), two of red and one of white. Probably this flag should be given preference in the group of six flags. The battle flag of the Confederacy - red field with blue cross and white stars -is often used. Many different banners were raised in revolt against Mexico, largely flags of individual military units. Prior to the Revolution, a number of independent flags were flown over Texas. During the era of filibusters and revolts against Spain from 1811 to 1821, the flags of Louis Aury and Jean Lafitte, privateers, were flown at Galveston. Dr. James Long from Mississippi hoisted a flag of red and white stripes with a red field and a white star in 1819. 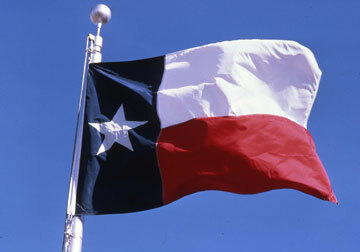 Possibly this was the very first "lone star" flag. When the Texas Flag is displayed out-of-doors, it must be on either a flagpole or a staff, and the staff should be at least two and one-half times as long as the Flag. The Flag is always attached at the spearhead end of the staff, and the heading must be made of material strong enough to protect the Colors. The Texas Flag should not be unfurled out-of-doors earlier than sunrise and it should be taken down, or furled, not later than sunset. Of course the Flag may be flown for any length of time between sunrise and sunset, as may be directed by proper authority. 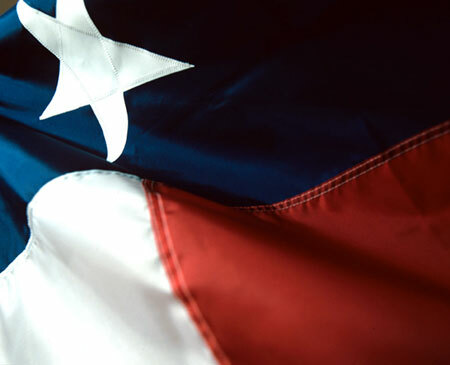 It is disrespectful to the Texas Flag to leave it unfurled in inclement weather, such as rain, sleet, snow, hail or storm, and it should never be left out-of-doors at night. The Texas Flag should be displayed on all State Memorial Days and on special occasions of historical significance. Every school in Texas should fly the Texas Flag on all regular school days. This courtesy is due to the Lone Star Flag of Texas. 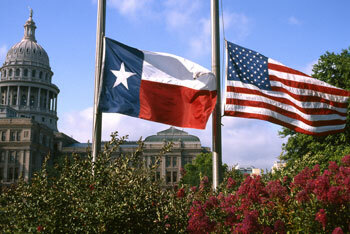 The Texas Flag should always be hoisted briskly, and unfurled slowly with appropriate ceremonies. The Texas Flag should not be fastened in such a manner that it can be torn easily. When the Texas Flag is flown from a flagpole or staff, the white stripe should always be at the top of the Flag, except in cases of distress, and the red stripe should be directly underneath the white. The Texas Flag should be on the marching left when it is carried in a procession in which the Flag of the United States of America is unfurled. The Texas Flag should be on the left of the Flag of the United States of America, and its staff should be behind the staff of the National Colors, when the two are displayed against a wall from crossed staffs. When the Texas Flag is flown from the same halyard as the Flag of the United States of America is flown, it must be underneath our National Colors. When the Texas Flag is flown on a flagpole adjacent to the flagpole on which the Flag of the United States of America is flown, it must be unfurled after our National Colors, and it must be displayed at the left of the Flag of the United States of America. When the Texas Flag and the Flag of the United States of America are displayed at the same time, they should be flown on separate flagpoles of equal length, and the Flags should be approximately the same size. When the Texas Flag is flown from a window-sill, balcony or front of a building, and flat against the wall, it should be on a staff, and the blue field should be at the observer's left. When the Texas Flag and the Flag of the United States of America are displayed on a speaker's platform at the same time, the Texas Flag should be on the left side of the speaker, while our National Colors are on the right side of the speaker. The Texas Flag should never be used to cover a platform or speaker's desk, nor to drape over the front of a speaker's platform. When the Texas Flag is displayed flat on the wall of a platform, it should be above the speaker, and the blue field must always be at the Flag's right. When the Texas Flag is displayed on a motor car, the staff should be fastened firmly to the chassis of the car, or clamped firmly to the hood. When the Texas Flag is displayed on a float in a parade, it should always be attached securely to a staff. The Texas Flag should not be draped over the hood, top, sides, or back of any vehicle, or of a railroad train, boat or airplane. The Texas Flag should not be used as any portion of a costume or athletic uniform. The Texas Flag should not be embroidered upon cushions or handkerchiefs, nor printed on paper napkins or boxes. The Texas Flag must not be treated disrespectfully by having printing or lettering of any kind placed upon it. The Texas Flag should not be used in any form of advertising, and under no circumstances may advertisements of any kind be attached to the flagpole or staff. It is disrespectful to the Texas Flag to use it for purposes of decoration, either over the middle of streets, or as a covering for automobiles or floats in a parade or for draping speakers' platforms or stands, or for any other similar purpose of decoration. For such purposes of decoration the colors of the Flag may be used in bunting or other cloth. The Texas Flag should not be carried flat or horizontally, but always aloft and free, as it is carried in a parade. The Texas Flag is flown at half-mast by first raising it to the top of the flagpole, and then slowly lowering it to a position one-fourth of the distance down the flagpole, and there it should stay during the time it is to be displayed, observing the rule, of course, that it must not be raised before sunrise and it must be taken down each day before sunset. In taking the Flag down, it should first be raised to the top of the flagpole, and then slowly lowered with appropriate ceremony. The Texas Flag should not be displayed, used, nor stored in such a manner that it can be easily soiled or otherwise damaged. When the Texas Flag is in such condition of repair that it is no longer a suitable emblem for displaying, it should be totally destroyed preferably by burning, and that privately; or this should be done by some other method in keeping with the spirit of respect and reverence which all Texans owe the Emblem which represents the Lone Star State of Texas. While rendering the salute to the Texas Flag, a person should stand erect, face the Texas Flag and hold their right hand over the heart.